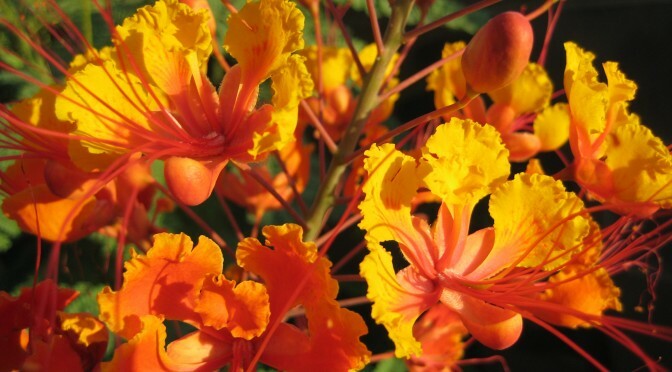 With the long hot summer we are having here in Texas, over 80 days above 100°F with no rain, one of the few plants that is really thriving is Caesalpinia pulcherrima, commonly known as Mexican Bird of Paradise, Red Bird of Paradise, Pride of Barbados, Peacock Flower, Dwarf Flamboyan, Caesalpinia, flamboyant-de-jardin, and Dwarf Poinciana. It is a member of the pea family (Fabaceae). The Red Bird of Paradise is the national flower of the Caribbean island of Barbados, and is depicted on the Queen’s Personal Barbadian Flag, which Queen Elizabeth II uses in her role as Queen of Barbados. Caesalpinia pulcherrima is native to the West Indies but was introduced to, and is commonly found in, Texas, Arizona, California, and Florida. 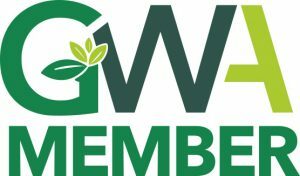 It is adapted to Plant Hardiness Zones 8 – 11. It grows best in full sun to partial shade and thrives in extreme heat. It is tolerant of both alkaline and acidic soils as long as they are well drained. It is considered drought tolerant once established but does best with regular irrigation once a week. In frost-free climates it is an evergreen tree or small shrub that grows to 3-10’ in height and width. It is damaged at 32°F and killed to the ground at 17°F so it typically grows as a deciduous shrub in zone 9, and a returning perennial in zone 8. In the topics it can reach heights of 15-20′. In most other zones, Caesalpinia pulcherrima can be grown as an annual, or potted and grown indoors as long as its light and moisture requirements are met. Its leaves are fern-like with many ¾” leaflets. They are a bright green in the summer but turn red in the winter until killed back. The species name, pulcherrima, is latin for “most beautiful.” Perhaps the most distinctive visual feature of this plant, that really lives up to it’s name, are its bright red, orange, and yellow flowers with long red stamens that are found on terminal ends of branches. They bloom profusely in the hot summer months and are an excellent draw for butterflies. If you are looking for a shrub that is heat loving and drought tolerant, or maybe you just want a unique specimen to show off in your yard or garden, you might want to give Caesalpinia pulcherrima a try. They also come in bright yellow, bright yellow, pink, and orange. Indeed, in the Caribbean islands they are mostly called Pride of Barbados.